If you’re destined to fail, wouldn’t it be better to get it over as soon as possible — like ripping off a Band-Aid quickly to avoid prolonged pain? There are distinct benefits to failing quickly rather than slowly. Total losses would be reduced considerably. You would be able to shift gears more quickly into a — hopefully — more profitable endeavor. How can you fail fast instead of failing slowly? We suggest thinking about your startup as an experiment, complete with surveys, customer feedback, and behavioral learning. Entrepreneurs have many more failures along the way than they have successes. But they don’t give up on their dream – they simply realize the reality of the situation and adjust accordingly. If they don’t fail quickly enough with experiments, their overall success would actually be much lower. Failure really isn’t failure if it improves your overall prospects for success. 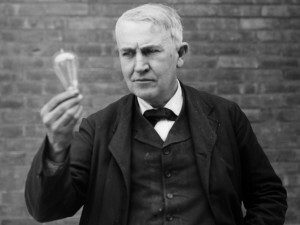 As Thomas Edison said after repeated unsuccessful attempts to create an incandescent light bulb, “I have not failed. I’ve just found 10,000 ways that won’t work.” The sooner you identify what doesn’t work, the sooner you can find out what will. We have the systems to help you fail quickly and adjust scientifically to turn your idea into a successful product or app.